St Johnstone jumped up two places to fourth in the Premiership, having survived an early Hamilton onslaught. Graham Cummins nodded in a Brian Easton cross before lashing in the rebound from a Michael O'Halloran shot. David Wotherspoon and O'Halloran then added fine shots from distance to send Saints on their way to a fifth successive away victory. Accies were denied by some smart goalkeeping until Jesus Garcia Tena scored with a free-kick and penalty. Those late goals gave the scoreline a more realistic look and the hosts will rue not taking advantage of their strong start. Hamilton looked as if they were in the mood to avenge the 4-1 loss in Perth in September and they quickly established themselves as the dominant attacking force, with Ali Crawford prominent. Accies created a flurry of early chances, the best of which fell to Christian Nade only for the striker to be denied by the feet of keeper Alan Mannus, who would follow that with a nimble tip away to deny the same player. As so often happens, the side on top lost concentration and Hamilton were caught out five minutes before the break as Darnell Fisher and O'Halloran linked to feed Easton and the left-back's accurate cross was nodded in by Cummins for an undeserved lead. Soon after the interval Accies were left with it all to do after Saints extended their lead. O'Halloran cleverly dragged the ball back to create shooting space from 12 yards and drew a wonderful reaction parry from Michael McGovern but the goalkeeper was helpless to prevent Cummins firing the loose ball in from an angle. It got worse for Hamilton as St Johnstone made the most of their lead to inflict further misery on their hosts. Wotherspoon had all the time he needed to control and shoot past McGovern for the third and Cummins wasted a golden chance to secure a hat-trick, firing into the body of McGovern. However, the fourth goal was only delayed by minutes as the impressive O'Halloran hit a 20 yard shot low into the corner on 67 minutes. Hamilton showed great spirit and kept fighting to claw back the deficit. Match ends, Hamilton Academical 2, St. Johnstone 4. Second Half ends, Hamilton Academical 2, St. Johnstone 4. Craig Thomson (St. Johnstone) wins a free kick in the attacking half. Corner, Hamilton Academical. Conceded by Craig Thomson. Goal! Hamilton Academical 2, St. Johnstone 4. Jesus Garcia Tena (Hamilton Academical) converts the penalty with a left footed shot to the top left corner. Penalty Hamilton Academical. Jesus Garcia Tena draws a foul in the penalty area. Penalty conceded by Murray Davidson (St. Johnstone) after a foul in the penalty area. Antons Kurakins (Hamilton Academical) wins a free kick on the left wing. Attempt missed. Michael O'Halloran (St. Johnstone) right footed shot from the centre of the box is too high. Goal! Hamilton Academical 1, St. Johnstone 4. Jesus Garcia Tena (Hamilton Academical) from a free kick with a left footed shot to the top left corner. Attempt saved. Dougie Imrie (Hamilton Academical) right footed shot from outside the box is saved in the top centre of the goal. Substitution, St. Johnstone. Craig Thomson replaces David Wotherspoon. Corner, Hamilton Academical. Conceded by Alan Mannus. Corner, Hamilton Academical. Conceded by Tam Scobbie. David Wotherspoon (St. Johnstone) is shown the yellow card for a bad foul. Goal! Hamilton Academical 0, St. Johnstone 4. Michael O'Halloran (St. Johnstone) right footed shot from outside the box to the bottom right corner. Murray Davidson (St. Johnstone) wins a free kick on the right wing. Goal! 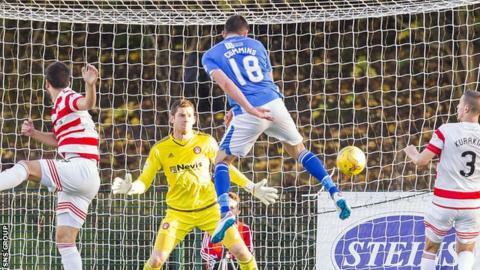 Hamilton Academical 0, St. Johnstone 3. David Wotherspoon (St. Johnstone) left footed shot from the centre of the box to the bottom left corner. Assisted by Liam Craig.